Children’s charity NSPCC have been bringing Christmas to life with their latest activity, Letter’s From Santa and asked me to get involved – spreading the word keeping the magic of Santa alive. 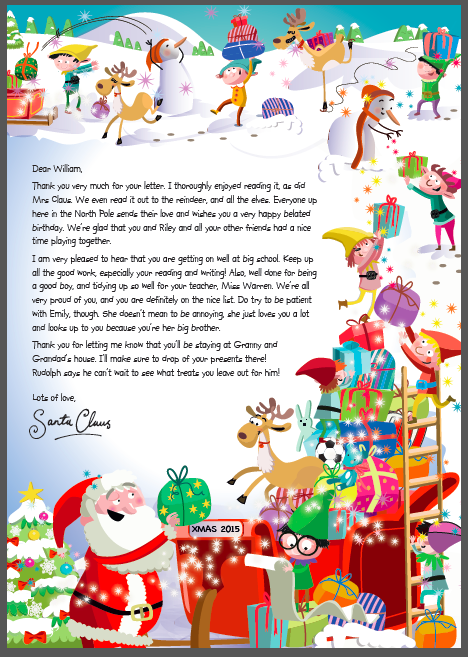 To this end, I provided them with information about my son William including hobbies, achievements, friends and siblings and then the wonderful people at NSPCC worked their own Santa magic to produce an incredible response to William’s information provided. There is still time to create one for your own children and print out ahead of Christmas by visiting the Letters From Santa for more details. To find out more about all the fantastic work NSPCC are doing over Christmas and how you can make a donation click here. What a lovely idea! I bet William was so pleased to read that. Really innovative way to raise awareness and funds for the NSPCC too. This is a great idea. I am all for finding ways to keep the magic alive! It’s such a great idea isn’t it?